CSAN Player Registration is online via Affinity. Please see the Registering with CSAN page for more details. Player releases can now be done online on Affinity. Go to the CSAN Player Release/Transfer page for full instructions. Transfers and dual registrations still require a paper form that can either be emailed, mailed or brought to the CSAN office with the $10 fee. You can call the office to pay the fees by credit card. CSAN Player Release of Liability Form Use this form as an alternative to the team CSAN Team Waiver Form (below) when registering a single player with CSAN. If you are not registering a player on-line, fill out the following form. CSAN Player Registration Form: To register new players. Print, fill out and sign the form and return to CSAN office with the player registration fee ($31.50). Parent Waiver: Players under the age of 18 who play for a CSAN affiliated team must sign this form and also obtain the signature of at least one parent. Must be submitted in paper form. 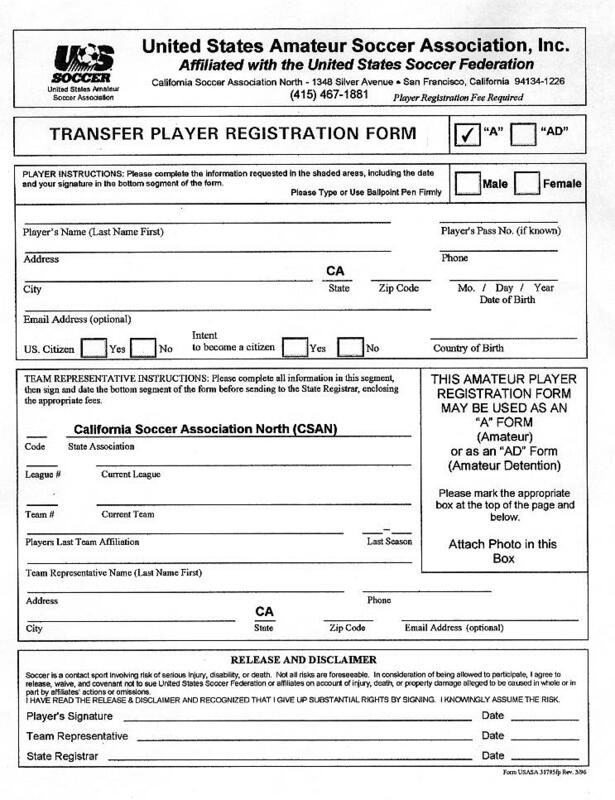 CSAN Annual Mandatory Form This form must be completed every fall season and returned to CSAN Office before any player can be registered. CSAN Team Waiver Form If your team is registering players via paper forms, every player must sign this form. Incident Report Form To report an incident complete this form then mail it to the VP of Discipline. Release of Liability Form (GGWSL) - This form is no longer needed as it is now incorporated in the CSAN Liability form. Request that an Executive Committee member fill out the Change Team Name form for your team. Once the formed is signed, turn it in to CSAN with the required fee. Once CSAN completes the process, provide the GGWSL VP of Scheduling your new team name. When a team name is changed, all player passes must be returned to CSAN so that they can be updated. It is recommended that teams change their name at the beginning of the fall season. Forms can be found on the CSAN Registration Forms and Documents page. As of Spring 2019, the CSAN office is open Monday AND Friday 9:00 am - 5:00 pm; Saturday 8:00 am - noon.